A lot of what you hear about document management revolves around “going paperless” or “saving trees”, but for many companies the process improvement is a more significant benefit than the decrease in paper. For the sake of this article, we’ll take a look at the accounting department, but keep in mind these process improvements can occur anywhere in the organization. We will cover a couple of your every-day processes that could be done more efficiently with an integrated document management solution. The specific Accounts Payable process varies from company to company, and many times if you ask a controller and an AP clerk to describe the process you will get two different answers. A document management solution can solve that issue by structuring workflows electronically and adding automation. When invoices enter the organization, you have lots of different options for how the approval process would look with Sage ERP Document Management. You can have approvers stamp their approval to the document, attach an electronic “sticky note” with comments, view and approve via smart phone or tablet, or you can include a form with the document that will allow approvers to enter or approve GL account codes. If you use a form to code the invoice, that data can be imported into your Sage ERP and used as indexing values to easily find that invoice next time you need it. This process can be further improved by adding alerts when invoices need to be approved or get held up too long. When a paper invoice is sitting on someone’s desk, everyone else involved in the process loses visibility. But with an electronic approval process, anyone with the proper security rights can view a document’s status or a run a report for all invoices that have fallen outside of the pre-determined guidelines. Sending invoices outside of your organization might be a time-consuming process as well. You probably have some customers who prefer to receive invoices via email and some who still prefer paper copies in the mail. Maybe you’re printing a batch then sorting through to find those that need to be emailed and creating each of those emails separately. 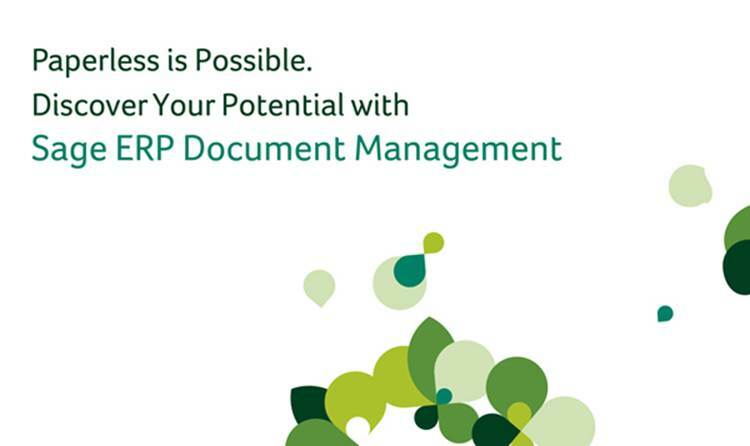 Consider instead using Sage ERP Document Management’s output automation tool. When you print a batch of invoices, the system will recognize those that need to be emailed and create an email with the invoice and any back-up documentation attached. The others will either be sent to a printer or sent out via fax depending on the receiver’s preference. There are even more processes that can be improved with an integrated document management solution, and lots more functionality options as well.